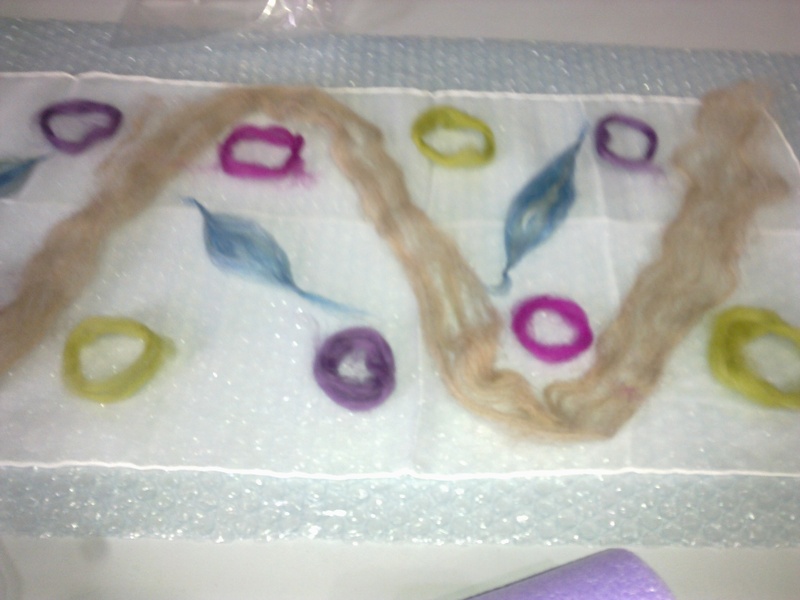 Tried a new form this week with a felting course run by the talented Julie Drobek. 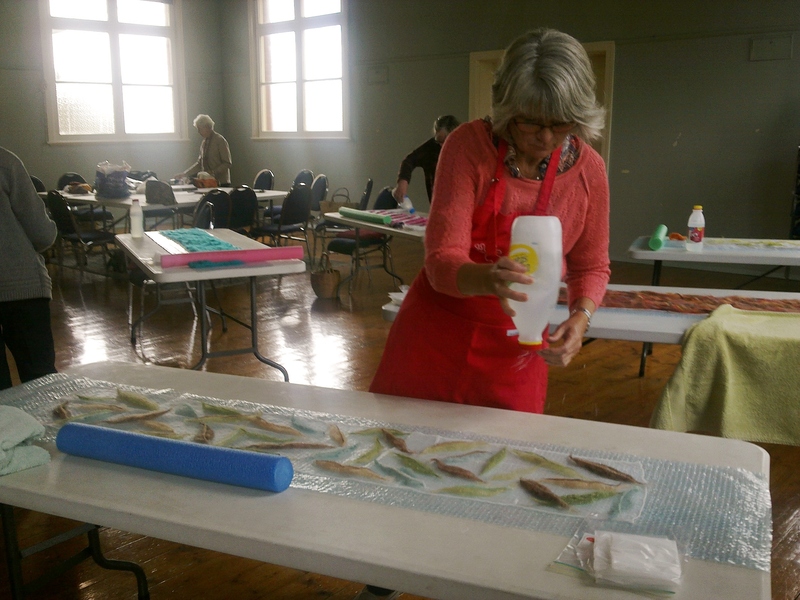 Julie has been felting for about 8 years and is a member of the Victorian Feltmakers Association. 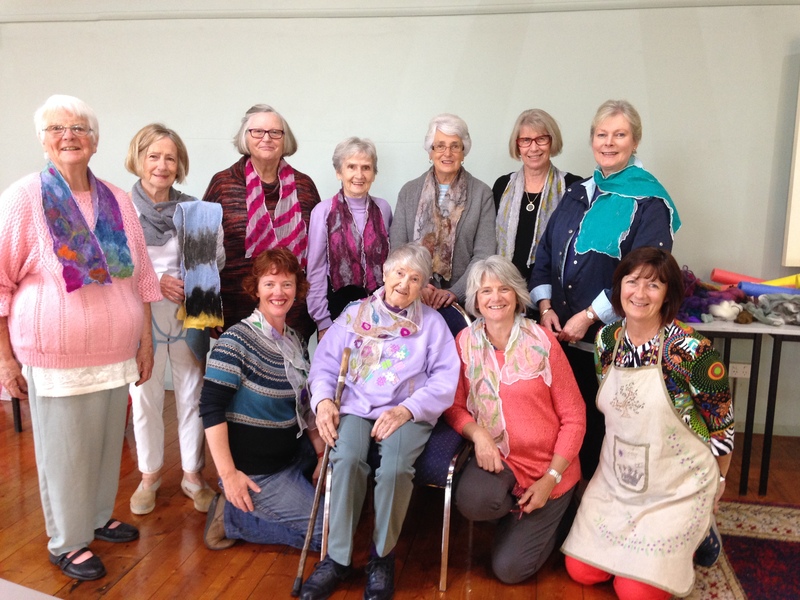 She makes amazing vests, scarves, skirts and creations (she recently sold a giant Far Away-style tree to a special school) and sells them through QAL Arts at the church once a month. Felting is an ancient art-form and Julie said in Mongolia the craft is still used to create housing in the form of tents. We weren’t quite so ambitious – just a pretty something that we can fling on during winter and tell people “I made it myself”. That’s mine on the far right. 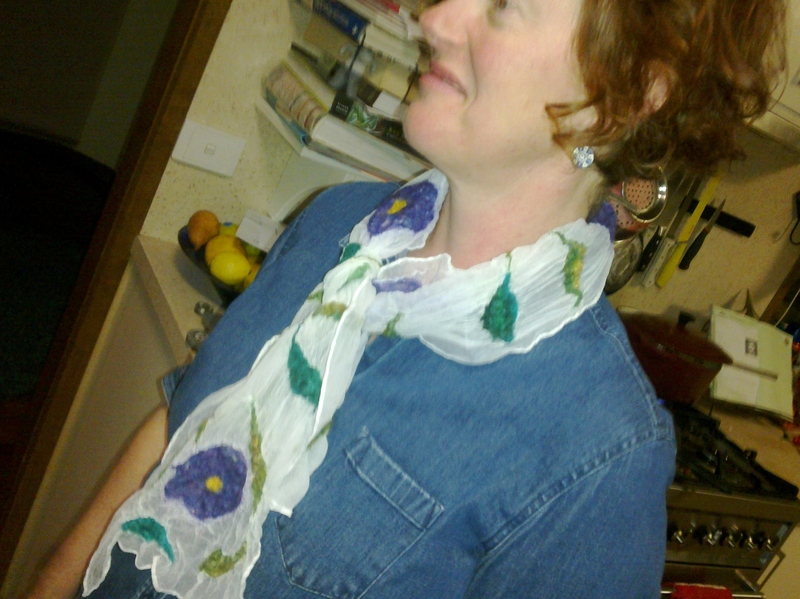 Julie taught me how to make ‘leaves’ by twisting the ends of a piece of wool. 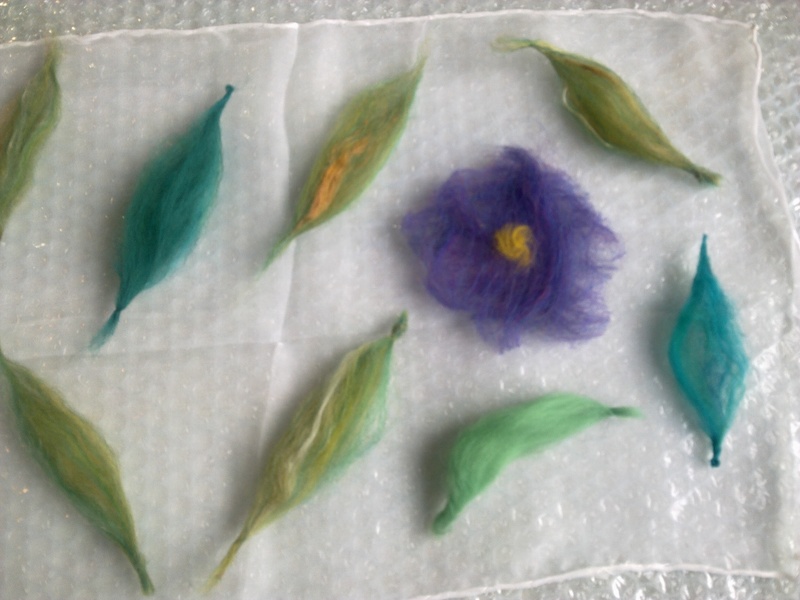 I made the flower by dry-felting two pieces of felt together – basically laying them with their fibres criss-crossing and then pressing them with my hand until the fibres mesh. Then you cut out your flower shape. Then you carefully spread a large sheet of plastic over your work and spread it flat, starting in the middle and pressing out some of the excess water. Next you take your bit of rubber noodle and roll it all up with a towel. 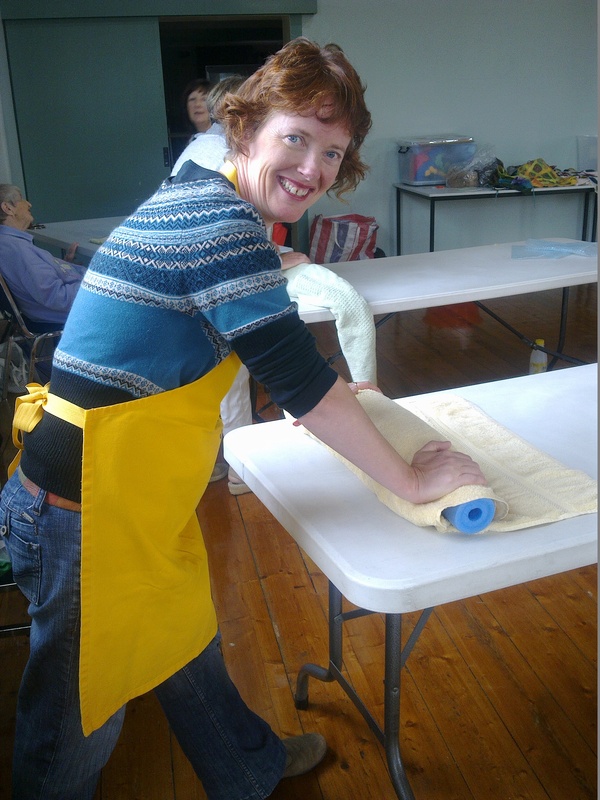 Once you’ve rolled for quite some time (Julie recommends counting to 200 slowly), you unroll and re-roll in the opposite direction. 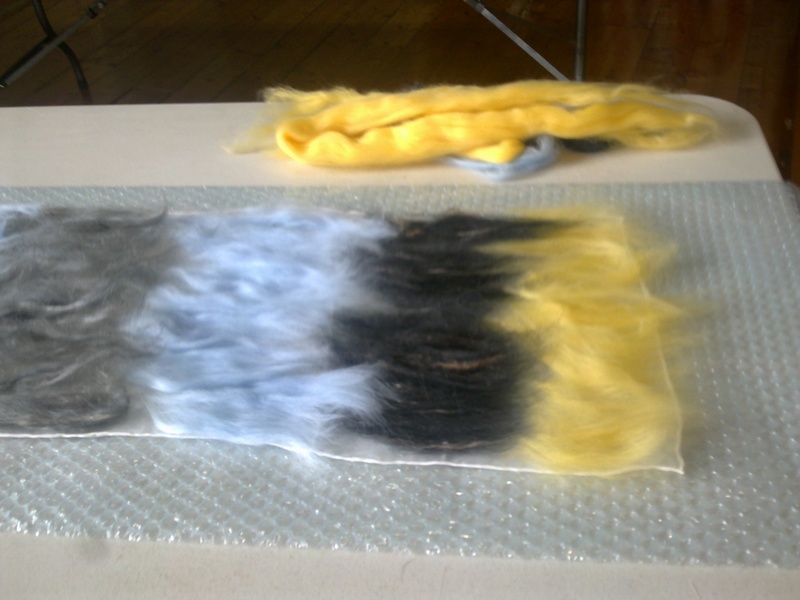 Then another scary bit – you unroll and carefully peel back the plastic to see if the wool has stuck. Mine had – yay! So the next thing you do is scrunch your scarf into a ball and throw it – hard – against the table. This activates the shrinking process. Once, you’ve really released your inner demons, it’s time to rinse the remaining soap out of your scarf with tepid water. Then you leave it to dry and wa-la! Here we all are sporting our new scarves. Busy Bee Fabrics, 170 High Street, Belmont sells Bendigo Wool.